. the patterns have such a bright, poppy feel that are just the right amount of modern. and the colors are beautiful! i found in a remnant pile for a steal. i was browsing target's web site today, and lo and behold . 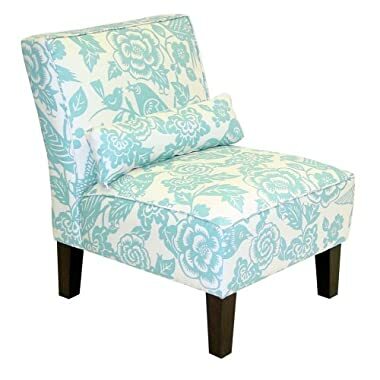 . .
the fabric looks great on chairs. 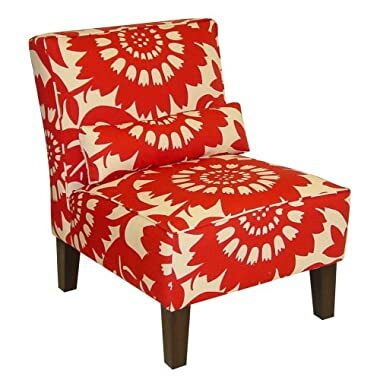 i'm not crazy about the chair style, but it is fun to see the fabric used in a different way. there are a million creative uses for fabric, so i hope this gets your mental wheels turning! thanks everyone for the encouragement about the headboard! again, let me just reiterate that i pretty much just copied instructions, with some problem solving involved (differences in fabric widths, adapting to use wood we already had, finding cheap foam, etc. all these things were like tests for my brain.). but again, it wasn't my idea (although someday maybe i'll start posting my own instructions. goals!). i'm totally predictable when it comes to patterns. i like patterns that have two colors only. one of those colors is usually white. here's the fabric we ordered for the headboard project. it's called stockholm in cherry, and was 20% off when i bought it. it comes in other colors, too. the pattern repeat is so large—i feel like it was made for this project. calico didn't have this color in the store, but i ordered it anyway because it is returnable. when it came, i was a little disappointed with the background color—it is a little yellowy for my taste—but ben liked it. he likes red. plus, i'm way too picky about white. it's time to branch out (well, at least to off-white, wink wink). now, in hindsight, i think it is just great. these others were in the running, but were vetoed (by both me and ben) in favor of the red. the colors for the bedroom are red, aqua, gray, and white—we already have a few aqua textiles and accessories, so they can stay. when i was buying batting at mill end, what do you know—i found 2.5 yards of it in the remnant pile for like $3.75 a yard. i saw it online for about $50 a yard, too, so i was pretty excited. can't wait to use it! beki said it tells a story . . .